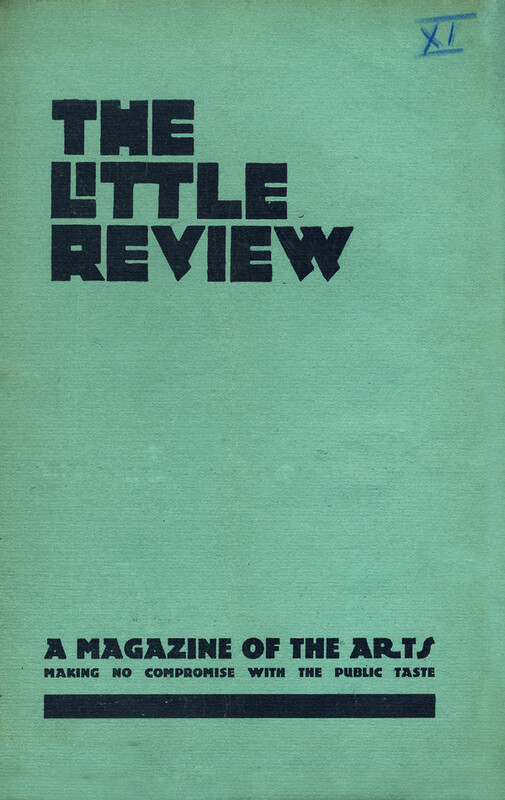 Margaret Anderson’s belief that art and life are inseparable inspired The Little Review. Anderson’s indiscriminate enthusiasm and diverse interests led to widely varied contributions during the magazine’s first years of publication. In 1916 Anderson persuaded publisher Jane Heap to contribute to the magazine and assume the role of co-editor, and together the editors – and sometimes lovers – looked to improve the quality of published contributions. Believing that the level of work printed in The Little Review was below their expectations and the public’s ability, Anderson sent a challenge to her readers and contributors in the August 1916 issue: “If there is only one beautiful thing for the September number it shall go in and the other pages will be left blank” (Anderson, “A Real Magazine,” III:v:2). The September issue featured thirteen blank pages and a set of cartoons depicting the bored editors. In response to this public declaration of deflated hopes, Ezra Pound offered to become The Little Review’s foreign editor. Anderson’s agreement to give Pound space to publish without interference proved hugely important to the magazine: critics often emphasize the importance of the works that T. S. Eliot, James Joyce, and Wyndham Lewis contributed in Pound’s section. Indeed, it was Pound who helped obtain rights to publish Joyce’s Ulysses serially, which led to much controversy: Anderson and Heap were found guilty of publishing obscenity and copies of The Little Review were confiscated across the country. Anderson, Margaret. “Announcement.” 1:1 (Mar 1914): 1-2. Margaret Anderson grew up in Indiana in a comfortable middle-class home. After leaving Western College for Women in Ohio, she landed in Chicago where she looked for work as a writer. She wrote for The Dial but, spurred by a lack of inspiration, she founded The Little Review in March 1914. When Anderson and Jane Heap began publishing selections of James Joyce’s Ulysses in 1921 they were convicted in New York of publishing obscenity. Anderson moved to Paris in 1922, and as her relationship with Jane Heap deteriorated she left The Little Review in 1924. Jane Heap was born in Topeka, Kansas and was interested in art as a child. She attended the Art Institute of Chicago from 1901 until 1905 and later studied art in Germany. Heap became co-editor in 1916 and contributed under the pseudonym “jh” to protect her anonymity. After the trial over Ulysses in 1921, Heap and Anderson’s relationship faltered, which led to Anderson’s leaving the magazine in 1924. Heap then became sole editor and used the opportunity to shift the magazine’s focus to the visual arts. Ending publication of The Little Review in 1929, Heap followed the work of Russian philosopher George Gurdjieff and began teaching his philosophy in London. Anderson, Margaret. My Thirty Years’ War. New York: Covici, Friede Publishers, 1930. “Anderson, Margaret C.” Archives: Fingind Aid. 26 Oct. 2004. “Heap, Jane.” Margaret Anderson and The Little Review. 26 Oct. 2004. Holly A. Baggett. “Anderson, Margaret.” American National Biography Online. Feb. 2000. Davidson College Lib., Davidson, NC. 26 Oct 2004. —–. “Heap, Jane” American National Biography Online Feb. 2000. Davidson College Lib., Davidson, NC. 26 Oct. 2004. Green, Michelle Erica. “Making No Compromise with Critical Taste: The War for The Little Review.” 26 Oct. 2004. Hoffman, Frederick J., Charles Allen, and Carolyn F. Ulrich. The Little Magazine: A History and a Bibliography. Princeton, NJ: Princeton UP, 1947. 52-66. Image, cover Autumn 1924 – Winter 1925. “Ernest Hemingway In His Time: Appearing in the Little Magazine.” 18 Nov. 2003.Special Collections Department. University of Delaware Library. 22 July 2009. Image, rollover, 9:3. “Apprenticeship and Paris.” 10 Sept. 2002. Department of Rare Books and Special Collections. University of South Carolina. 13 July 2009. Images. “The Little Review.” Modernist Journals Project. Web. 13 Jun 2016. The Little Review. 1914 – 1929. New York: Kraus Reprint Corporation, 1967. Mott, Frank Luther. A History of American Magazines vol. 5. Cambridge, MA: Harvard UP, 1968. 166-178. Scott, Thomas L. Pound/The Little Review: The Letters of Ezra Pound to Margaret Anderson. New York: New Directions Co., 1988. Wilhelm, J.J. Ezra Pound in London and Paris 1908-1925. University Park, PA: Pennsylvania State UP, 1990.